New research from the Solar Energy Industries Association and GTM Research shows that the United States saw record growth in solar energy installations in 2012 – more than 16 million panels – making it the fastest growing domestic energy source. In total, solar reached a 76% growth with 3.3 gigawatts installed. One whole gigawatt went on rooftops in California, and Arizona and New Jersey came in second. Most of this growth took place during the fourth quarter of 2012, which saw 1.3 gigawatts installed. The biggest factor is the dramatic price drop in solar panels, along with statewide incentive programs and financing deals from companies that agree to cover upfront costs. 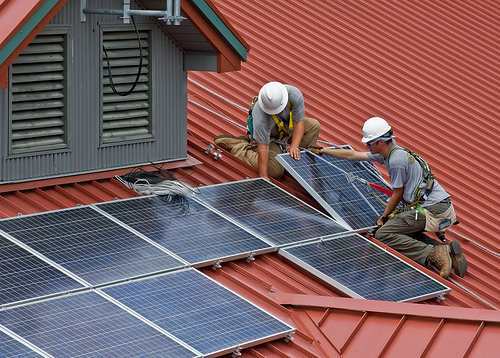 The trend is expected to continue throughout 2013, and analysts are anticipating 4.3 gigawatts of new installations, a 29% increase over 2012. Today, there are 300,000 solar panel systems in the United States, a total of 7.3 gigawatts. As solar, wind, and other clean energy sources continue to rise, the good news is that we are also seeing a decline in coal and gas. Coal went from 22.5% to 18.1% of the energy mix in 2012, and oil reduced from 39.3% to 36.7%. Keep up the good work, ‘Merica. Image CC licensed by Wayne National Forest: Installing rooftop solar panels. While it’s positive to see more solar panels being built, alone, it will never keep up with demand. Huh? Why not? Solar panel companies have been closing partly due to overcapacity in the market.